Voters in some parts of Venezuela are being urged to go to the polls on Sunday in a dress rehearsal for October's presidential election. The electoral commission hopes many of the 250,000 voters registered at the 55 centres selected will turn out. They will be using a new electronic system in October's election, which pits President Hugo Chavez against opposition candidate Henrique Capriles. It is expected to be the closest vote yet for Mr Chavez. If the election goes ahead as planned on 7 October, voters in Venezuela will have to identify themselves by their fingerprints before they go on to vote using an electronic system. On a cloudy Caracas day, the electoral authorities turned out in force for the voting rehearsal at a school in the centre of the city. Dozens of soldiers were also on hand to take care of security as a few voters trickled in. The exercise was designed to test Venezuela's electronic voting system. Instead of a choice of presidential candidates, the test voters were asked to cast a ballot for their favourite among a number of Olympic sports. President Chavez's PSUV party took advantage of the occasion to campaign outside. 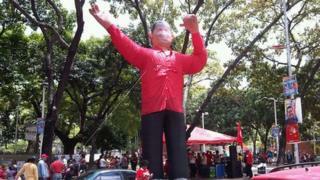 Party members set up a 6m-high (20ft) inflatable Hugo Chavez figure and played salsa music in the street, handing out leaflets to passers-by. Aside from a few posters of Henrique Capriles, there was no sign of the opposition. "We're going to test everything concerned with the layout of the polling stations, which has changed a little from the traditional layout, and where voters go for each phase of the voting process," Sandra Oblitas, the vice president of the electoral commission, told the BBC. Campaigning is already in full swing ahead of the election, which could be the closest contest yet for President Chavez, says the BBC's Sarah Grainger in Caracas. He has been in power since 1999, but was diagnosed with cancer last year.